The Columbia Girl's Youth Mighty Mogul™ Jacket is mountain ready! He'll ski hard in this waterproof-breathable, insulated high-tech marvel that takes on the harshest conditions with features like a micro fleece lined hood, media and goggle pocket, adjustable powder skirt and a convenient ski pass pocket. Also includes our unique OUTGROW system to accommodate growth spurts. 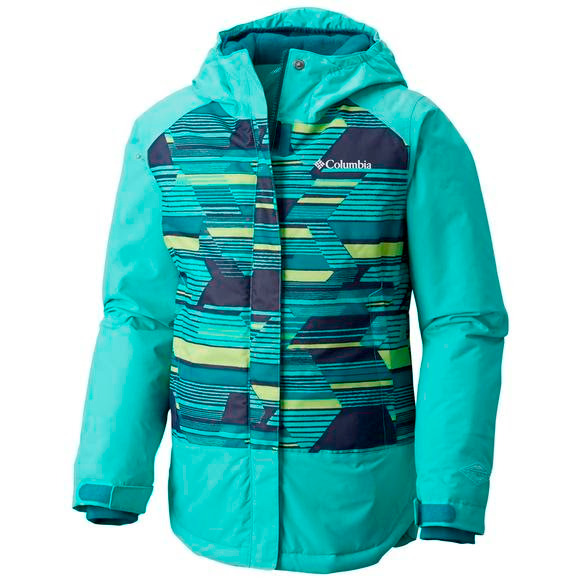 The Columbia Girl&apos;s Youth Mighty Mogul™ Jacket is mountain ready! He&apos;ll ski hard in this waterproof-breathable, insulated high-tech marvel that takes on the harshest conditions with features like a micro fleece lined hood, media and goggle pocket, adjustable powder skirt and a convenient ski pass pocket. Also includes our unique OUTGROW system to accommodate growth spurts. This thermal reflective technology helps regulate your temperature by reflecting and retaining the warmth your body generates, while dissipating moisture and excess heat to keep you comfortable. Omni-Tech fabric provides premium waterproof breathable protection from the elements for Columbia&apos;s best products. Microporous material allows vapor from perspiration to escape while blocking outside moisture from entering resulting in a garment that can keep you comfortable and dry even when you&apos;re performing in adverse conditions. The OUTGROWN Grow System from Columbia allows you to extend the life of your child&apos;s Columbia outerwear so that it lasts through multiple seasons, regardless of growth spurts. Located on the pant legs and jacket sleeves of select Columbia products, is an extra bit of fabric that is held back by a contrasting thread (pictured in blue below). Simply fold the sleeve or pant leg inside out, snip this thread and pull to extend the length of the sleeve or pant leg by 1.5 inches. Garments with the OUTGROWN system are great for younger kids who are constantly growing out of clothing from season to season.